Hand tools with fixed or variable openings, used for tightening and loosening nuts and bolts, and for assembling and disassembling objects. Wrench with a usually smooth, adjustable opening, for tightening objects that are somewhat fragile. Wrench whose jaws are perpendicular to a telescoping handle, and pivot to open at variable positions; it is used for working in cramped spaces. 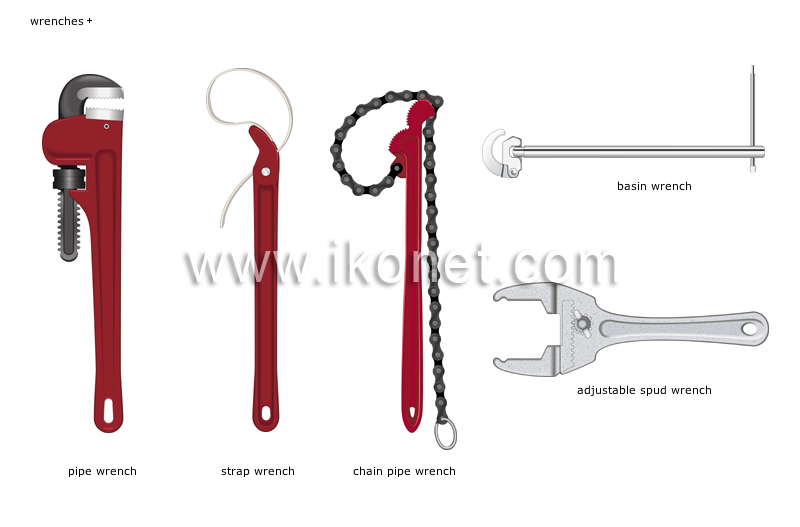 Wrench whose chain acts as a jaw for gripping large pipes and irregularly shaped objects. Wrench whose strap acts as a jaw to grip objects that are difficult to access or whose surfaces must not be damaged. Wrench with notched jaws and adjustable opening for firmly gripping nuts, couplings and thick-walled pipes.